One really wishes things turn out perfect. When one wants to diet, one can and when want to indulge one can. How marvelous that will be right? Sadly it is not so perfect all the time. When you want to diet, you get tempted with so many delicious treats that either you are forced to make or get forced by others. You indulge in guilt, thinking all the time how the scale is going to shoot up the next time you torture it. One of the best jokes that I remember on the scale has been the all time funny one. When a chap stands on the scale, the poor scale pleads back, “One at a time please!” Imagine if that could happen real time! Anyway I was happy that there was no increase but rather no loss too. Still it is a good sign. Coming to the recipe for today. This was one of those healthy breads that is good during dieting. I followed the same original way it is done, except made it even more healthy by adding mashed peas to the dough. Athamma normally makes Ragi Roti by patting it down on a muslin cloth, as shown in the Ragi Roti Post. If you are using dried peas, pressure cook the peas and mash the peas. With fresh peas, just mash them with ladle and mix in the salt, chilli paste and coriander leaves together. Mix this paste to the Ragi flour and proceed as how it is shown in Jonna Roti post. So this was my lunch during the weekdays. Planning to make other breads with whole grains for lunch, instead of the usual Goduma dosa/ Wheat flour Dosa that I have been carrying. Addition of stuffing is a great idea…looks delicious.. 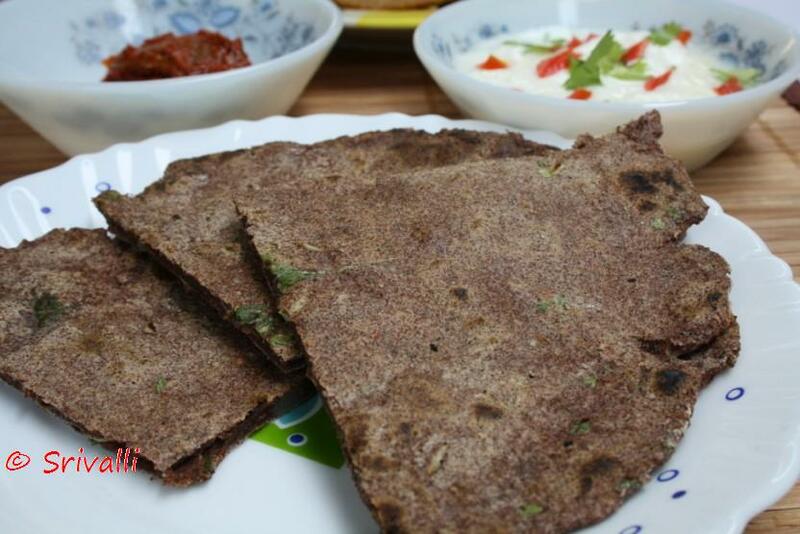 Stuffed ragi roti sounds like a great idea!! I make ragi roti all the time but have nvr added peas, good idea..